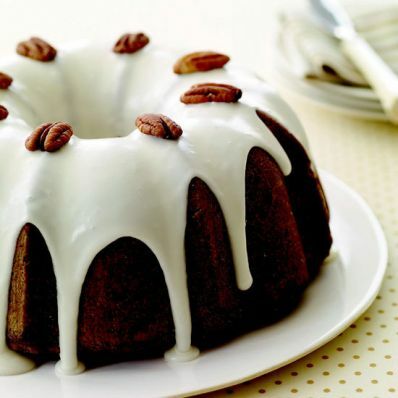 This old-fashioned nut cake is generously filled with pecans. Be sure to chop them finely so they spread evenly throughout the cake. 1 of 5 Grease and flour a 12-cup bundt pan. 2 of 5 With an electric mixer, beat butter in large bowl until fluffy. Gradually add sugar. Beat until very light and fluffy. In a bowl, beat yolks for 5 minutes, until thick; fold into sugar mixture. 3 of 5 Sift flour, baking powder, salt onto parchment or waxed paper; alternately add to yolk mixture with cream and vanilla. Fold in pecans. 4 of 5 In a large bowl, beat egg whites until they form stiff but not dry peaks. Fold into batter; spread into prepared pan. 5 of 5 Bake at 325 degrees F for 1 hour, 10 minutes, or until cracked slightly. Cool cake in pan. Remove from pan; spoon on Sugar Glaze. Top with pecan halves. 1 of 1 Combine 1 cup confectioners sugar and 1 teaspoon vanilla in a small bowl. Add about 5 teaspoons milk to make a thick, pouring consistency. Per Serving: 13 g sat. fat, 53 g carb., 7 g pro., 114 mg chol., 35 g Fat, total, 97 mg sodium, 3 g fiber, 542 kcal cal.